Mammoet delivers engineered heavy lifting and transport services to safely optimize timelines and increase efficiency for the petrochemical sector. From planning and construction to maintaining productivity during expansions, Mammoet’s heavy lifting and transport services are vital to the efficient execution of petrochemical plant projects. Petroleum, plastics, paints, fertilizers – the petrochemical industry is one of the drivers of the world economy. While new markets like India and China present many opportunities, today’s petrochemical producers also face numerous challenges. From environmental regulation to changing commodity prices and on to fluctuating levels of demand on the global market, profitability is always under pressure. With Mammoet’s extensive experience in the petrochemical industry, we are ideally positioned to help refinery and chemical plant operators control costs. Whether it is the construction of a new plant, installation of new equipment, a turnaround or shutdown, plant expansion or relocation, we work in close collaboration with our customers so that all heavy lifting and transport required for the project is carried out as efficiently as possible. Involving Mammoet from the earliest stages of a refinery or chemical plant project means that engineered heavy lifting and transport requirements can be integrated from the planning and design phase. The critical path can be determined, and Mammoet’s expertise brought to bear on the overall logistics to ensure that all issues of access, transportation and installation are efficiently scheduled — and that contingencies are considered and mitigated against. Our experienced teams have carried out major petrochemical construction projects around the world, and Mammoet has lifting equipment capable of addressing a broad range of requirements. Across all markets our safety focus meets, and even exceeds, local regulations. We have a network of shipping contacts around the world, alongside strong relationships with port and transport authorities to help ensure all the necessary paperwork is arranged. Whether you want to plan every lift of a shutdown before the first bolt is turned, identify the benefits of modularization by analyzing the complete logistical chain for your project, or evaluate your plant design to optimize the construction schedule, our early involvement will greatly contribute to your project’s success. This is because engineered heavy lifting and transport, although not usually the biggest expense, can have a disproportionally large influence on the efficiency of a project. By keeping your project on track, Mammoet will help ensure the plant goes into productivity on time. In the case of turnarounds, shutdowns or relocations, our contribution can be crucial in minimizing downtime and lowering costs. Alongside our ability to optimize your project at the planning and design phase, we can reliably, swiftly and safely execute the operation. Our professionals combine a focus on getting the job done with a stringent approach to safety. The can-do attitude of our global team of professionals, our engineering expertise and our state-of-the art equipment always deliver a safe and high-quality execution – meeting, and even beating, deadlines for clients around the world. After all, in the highly competitive environment of refineries and chemical plants, time is the currency that matters most. Successful heavy lifting and transport operations at refinery or chemical plant construction sites begin with careful planning by Mammoet’s specialists to define the most efficient logistical and installation approach. Involving Mammoet’s engineered heavy lifting and transport specialists early in the planning and design stage of a petrochemical construction project is crucial. With their expertise, the refinery or chemical plant’s critical path can be shortened through reliable planning, improvement of efficiency and the reduction of costs. We use our experience and in-depth knowledge of heavy lifting and transport equipment to consider the three fundamental operational elements of any project: construction approach, transportability and productivity. By understanding the size and weight limitations of the components; how to lift, transport and install them; and how to optimize the heavy lifting and transport process, huge benefits can be realized in refinery and chemical plant construction. The construction approach and installation sequence of components and modules is the first consideration. Different construction methods – ranging from ‘stick-built’ on location to offsite modular construction – offer specific opportunities to optimize the construction efficiency of a refinery or chemical plant. The maximum allowable sizes and weights of elements have a defining influence on realizing these efficiency gains. Logistical considerations such as the positioning of saddles and lifting points can be defined at an early stage and will affect the structural design of oversized and heavy items, such as catalytic crackers, coke drums, reactors and modules. This may depend on what transport configuration, installation approach and equipment will be most efficient and practical for the plant. Considering such factors early during the planning and design stage will help ensure a smooth logistical and installation process when engineered heavy lifting and transport equipment is deployed. Many of the logistical limitations for transporting oversized and heavy items are defined by the location of the refinery or chemical plant construction site. Transporting components and modules from the manufacturing facility to the construction site might require an integrated chain of logistical activities with multiple handover points between different modes of transportation. If not properly planned and managed, these handovers can have a huge impact on cost and timeline. The most efficient routes need to be determined for all items and ways must be found to deal with infrastructural bottlenecks, while complying with all local rules and regulations. The overall logistics plan needs to address each change in transportation mode in detail to ensure the components arrive in sequence for installation. Further optimization of the construction schedule can be realized by analyzing all horizontal and vertical moves across the refinery or chemical plant site to determine the right amount and type of lifting equipment and resources are on hand. By optimizing equipment and resource utilization, engineered heavy lifting and transport experts can make a project more cost effective. 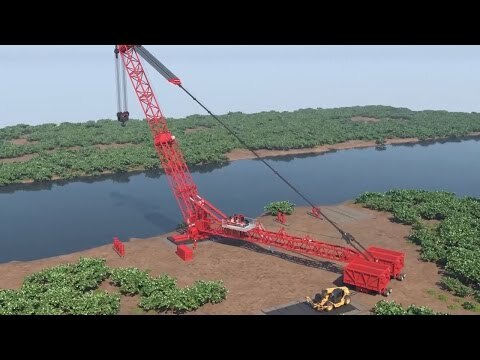 For example, in some cases one large crane can replace multiple smaller cranes and optimize utilization schedules while minimizing mobilization and demobilization activities. Connecting construction approach, transportability and productivity, and finding the optimum relationship between them, requires early collaboration between construction engineers and Mammoet’s professionals. Potential transport and installation bottlenecks can be identified early and creative engineering solutions applied to overcome them. Our professionals can undertake a thorough analysis of construction methods and find the most efficient dimensions and weights of components and modules for chemical plant or refinery construction. This analysis takes into account the best transport routes, on-site logistical possibilities and the necessary amount and type of heavy lifting and transport equipment needed for installation. These different methods are then assessed for their risks and cost/benefit implications. Through early collaboration, joined-up planning can move deadlines forward, reduce costs and ensure an overall smooth, safe and on-time execution of the petrochemical construction project. Realizing the safest and most efficient process on a refinery or chemical plant project requires a deep understanding of construction approaches and logistical operations. Yet the importance of involving engineered heavy lifting and transport specialists at the Front-End Engineering Design (FEED) stage is sometimes underestimated. From our large pool of experienced engineers, Mammoet can provide essential insight, based on our longstanding expertise, to help our petrochemical clients analyze construction and installation approaches. Mammoet has the in-house engineering capacity to determine all factors that are likely to affect components and modules along the entire logistics chain. At the design stage, we can advise our clients to ensure components and modules are suitable for specific modes of transport or a variety of transport options. During execution, a detailed and integrated plan helps to save time and additional costs. For example, determining the positioning of saddles and grillage at the design stage helps to ensure a smooth transition from one mode of transport to another at handover points. Route surveys deal with issues such as port accessibility and suitability to handle heavy cargo, handover points, physical restrictions or bottlenecks and local rules and regulations. They can also help to identify opportunities to optimize the logistics chain. Having carried out countless heavy lifting and transport projects around the world, Mammoet has expertise based upon a global network of offices and relevant contacts in the major industrial centers globally. These help us assess the best approaches possible and even identify solutions, which may not have seemed possible or practical at first. Mammoet’s experienced operators and state-of-the-art equipment can deliver the most efficient process at a refinery or chemical plant construction site. Realizing the full potential of efficiency gains is only possible by investing time and expertise in the early planning and design stage. That is when many strategic and tactical decisions need to be made to ensure optimal utilization of equipment and resources. Leo Versluis, Senior Contracts Manager for Mammoet Europe, has been with Mammoet for over 40 years. His broad experience includes engineering, sales and tendering, operations and project management in different industries. The right logistical process is crucial for the critical path of a refinery construction or upgrade project. Mammoet’s expertise in heavy lifting and transport ensures all components arrive safely on site in the correct order, at the right time. Mammoet’s engineered heavy lifting and transport specialists play a defining role when it comes to the logistical aspects of transporting oversized and heavy items from manufacturing facilities to petrochemical plant construction sites around the world. With productivity and efficiency at the top of the agenda, refineries and chemical plants are being built at even larger scales. To maximize construction efficiency, oversized and heavy components and modules are becoming the norm. This requires heavy lifting and transport specialists like Mammoet to constantly push the boundaries of what is logistically possible. 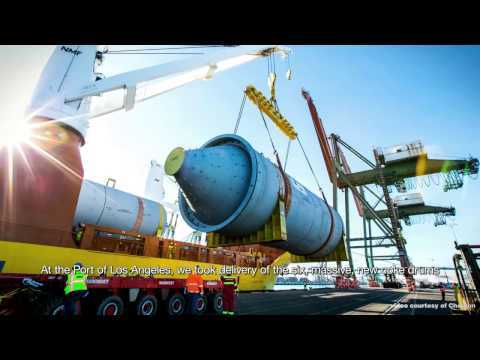 The challenge is to safely transport pre-constructed components such as reactors, catalytic crackers, distillation towers, coke drums, pipe racks and other large vessels or modules quickly and efficiently to sites which may be remotely situated or in hard to access locations. By carrying out route studies, Mammoet professionals can identify infrastructure limitations between manufacturing facilities and construction sites that could complicate the transportation of oversized and heavy items. Tunnels or bridges may be too low, bridges too weak or road gradients too steep. Some areas may present specific risks, for instance when crossing remote polar or desert environments to reach new refinery and chemical plant locations. Many risks can be avoided or mitigated by developing alternative transport options – either to bypass bottlenecks, overcome them using engineered solutions or even unlock an entirely new route. Mammoet resolves logistical challenges by finding the optimum route and overcoming obstacles by designing solutions such as road and bridge reinforcements or temporary bridges and jetties. Stepping from a creative logistical solution to a flawless execution requires engineering skills, heavy lifting and transport expertise, and a comprehensive fleet of equipment suitable for the loads. The end result is an optimal logistical chain for all individual oversized and heavy items in alignment with the overall project plan. Along the logistical chain, land and water-based transport solutions may be used, often involving different operators with their own separate transport plans, equipment and workforces. A fragmented logistical chain can lead to delays and additional costs, such as demurrage charges, when transporting oversized and heavy items. With Mammoet your project benefits from our integrated approach, and our professionals will sequence and manage all logistical activity for maximum efficiency. Mammoet’s factory-to-foundation (FtF) service brings the advantage of working with one specialist in charge of all the logistics for oversized and heavy items. This starts by picking up the reactor, distillation tower, coke drum or module at its manufacturing site and ends with installation at the construction site. With us managing the entire logistical supply chain it is possible to optimize operations, avoid delays and increase the efficiency of transport by road, water and rail. This includes efficiently processing required documentation for border crossings and obtaining abnormal load permits. Our FtF service ultimately delivers a tailor-made and optimized logistical chain, minimizes the number of handover points, and ensures smooth handling between different modes of transport. This reduces or eliminates demurrage charges and ensures all components and modules arrive on time and in the right order for on-site installation. Case Rolling the drums before the californian sunrise. In an ideal logistics scenario, components and modules would roll off the ships as they arrive for direct, on-site installation, avoiding double handling. In reality, however, modules are often shifted around construction sites up to a dozen times prior to being finally installed. This is because different contractors work according to their own plans and schedules in an un-coordinated fashion. It almost always leads to budget overruns. Taking an integrated approach for all engineered heavy lifting and transport activities across the project contributes to greater efficiency, cost-effectiveness and safety. Mammoet has the experience and expertise to effectively deal with all challenges when transporting oversized and heavy items from factory to foundation, ensuring safe and on-time arrival. Extensive knowledge of transport regulations and customs in many countries around the globe, alongside our broad and long-standing experience with all modes of transport, ensures a streamlined logistical process. For on-land activities, we own the most modern and diverse fleet of lifting and transport equipment. Mammoet has its own chartering offices with a network giving access to a large, state-of-the-art fleet of ships and barges for transport by water. Having one central point coordinating the entire logistical chain eliminates many risks, such as delays at handover points, incurring demurrage charges or other avoidable costs. This contributes to a smooth and efficient refinery or chemical plant construction project, from factory all the way to installation at the foundation. Robin Koenis is the Managing Director for Mammoet Asia Pacific Region. He joined Mammoet in 1997 and has worked as a project engineer and commercial manager on many heavy lifting and transport projects around the world, including refinery and chemical plant construction. Engineered heavy lifting and transport expertise delivers efficient refinery and chemical plant construction projects. Mammoet’s integrated approach optimizes all lifting and transport processes. On top of flawless and safe execution, a petrochemical construction team needs expertise, ingenuity and the right toolbox of heavy lifting equipment to manage the critical path. The scale of refinery and chemical plant construction projects has led to increasingly complex operations. This in turn creates new demands for on-site lifting, transport and installation services. By working with Mammoet early on in the construction process, the risks and challenges can be managed for a quicker, safer and more efficient operation. Many refinery and chemical plant construction sites see multiple contractors and subcontractors working on their own scope of tasks and schedules. Often, this means duplicate resources, both labor and heavy lifting and transport equipment. With separate resources and different schedules, it is difficult to optimize all lifting and transport movements across site. Too many cranes, transport solutions and workers on site leads to underutilization, congestion and budget overruns, not to mention safety concerns. Mammoet offers an integrated, cross-site approach covering all lifting and transport activities. A single point of contact streamlines communication and allows for the alignment and optimization of site activities and installation schedules – maximizing construction efficiency, safety and cost-effectiveness. One point of contact and one pool of lifting and transport equipment results in optimal deployment of lifting and transport equipment. This minimizes mobilization and demobilization activities and reduces on-site congestion. Equally important, our centralized approach means contingencies can be made when required, contributing to safer construction while adhering to schedules and budgets. Construction projects are often subject to change. For example, the delay of a reactor, distillation tower or coke drum can potentially disrupt the overall installation sequence. If surrounding construction work is placed on hold while waiting for the delayed item, the entire construction process, project schedule and budget may be compromised. A carefully planned delivery schedule for key components can minimize the risks of such delays. If an unexpected change occurs, it is essential to get the project back on track as swiftly and safely as possible. Our engineered heavy lifting and transport experts will have an integrated plan to protect the critical path and will develop engineered solutions to neutralize or mitigate delays and their knock-on effects. Mammoet’s expertise, combined with a broad overview of the entire schedule and the availability of a large pool of skilled people and specialized lifting equipment, enhances flexibility. Our access to these resources means schedule changes can be accommodated while maintaining maximum utilization across the site. Case Adding brains to 120 cranes, brings any deadline forward. 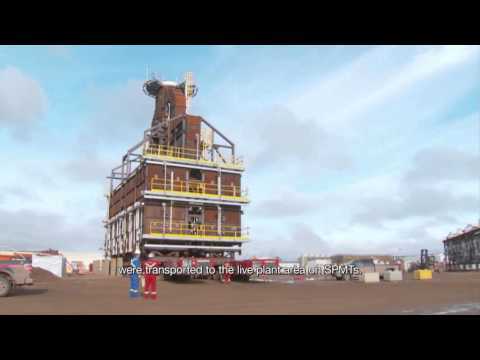 At Mammoet, we understand that the construction process is never perfect. There are always unexpected changes. Dealing with them effectively and safely requires a high level of expertise. Our professionals move across different sectors, learning and applying their knowledge, and gathering a broad array of experience across various industries in the process. In an ever-changing market, we want our people to be able to react swiftly out in the field using a vast toolbox of creative solutions. Our cross-sector experience means this capacity is built into our teams, resulting in safety, quality and flexibility. We can improve the quality of the construction process by taking an integrated approach. By optimizing lifting and transport activities across the site with one point of contact, safer and more efficient handovers are possible all along the critical path. With a complete overview, Mammoet can align site-wide lifting and transport plans, allowing for better utilization of equipment and less congestion. The result is even greater flexibility to deal with contingencies, benefitting the overall construction process. With an overview of all schedules on site, Mammoet can re-align activities if necessary, minimizing impacts on the critical path. In some instances, using one large crane that can reach over structures, rather than a number of smaller pieces of lifting equipment, results in a more efficient critical path. If a vessel is delayed, surrounding project work can remain on schedule and the large crane can lift it into place when it arrives. Such an approach accommodates the delay while helping ensure the entire project schedule stays on track. Realizing such solutions is only possible through dedication, experience and access to a vast array of equipment – allowing for flexibility to safely deal with unexpected situations in the field. Anthony Garcia is the Branch Manager at Mammoet USA responsible for Louisiana, Mississippi and Alabama. Having joined Mammoet in 2007, as project engineer and project manager he gained deep experience in preparation and execution of refinery and chemical plant construction projects. The processing equipment deployed at refineries and chemical plants operates under challenging circumstances. Oil derivatives and chemicals are treated at high temperatures and pressures, and plants are subject to stringent rules and regulations. This creates an environment with continuous maintenance requirements, some of which are not possible to plan in advance. Mammoet’s specialized engineered heavy lifting and transport services are essential for many planned and unplanned maintenance activities, such as the replacement of appendages and the removal of large and heavy components for cleaning and inspection. Our experts, trained in both site safety and the use of heavy lifting and transport equipment, provide regular on-site maintenance support, planned replacement or servicing support or can be swiftly mobilized when a rapid response maintenance call comes through from our clients. Daily maintenance jobs on refineries and chemical plants generally require a basic crew of personnel plus heavy lifting and transport equipment. Refinery and chemical plant operators often choose to work with multiple contractors located close to the site. While this is understandable, working with multiple parties frequently makes it more difficult to shorten lines of communication. It becomes a challenge to optimize schedules, increase the amount of labor and equipment when needed, and ensure all safety procedures are in place. 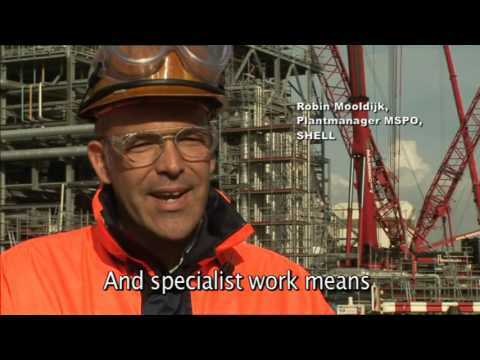 By working with one heavy lifting and transport specialist like Mammoet, refineries and chemical plants benefit from the integration of such activities across their sites. At Mammoet, we have the resources, skills and flexibility to scale up operations at short notice and can improve response times and carry site maintenance work out efficiently while maintaining the highest safety and quality levels. Our familiarity with petrochemical plants and their safety procedures is particularly valuable, since expansions and alterations that occur over time tend to make refineries and chemical plants more complex and congested. Certain equipment and components become hard to access with heavy lifting and transport equipment. Mammoet has extensive experience working on refineries and chemical plants, with established knowledge of the specific requirements for each type of site. Consequently, we offer a highly efficient and professional heavy lifting and transport service in petrochemical plant maintenance. A strong long-term maintenance relationship with a single engineered heavy lifting and transport specialist like Mammoet will help to build trust, enhance the efficiency of administrative systems and lead to deep plant familiarity. All of these aspects lead to streamlined daily maintenance and can reduce downtime for scheduled works, inspection, replacement or expansion work. Comprehensive plant know-how, combined with on-demand expertise, equipment, permits and safety training, results in minimal disruption to the live environment and optimized plant uptime during petrochemical maintenance work. Case Reducing downtime in tight conditions. Maintenance of refineries and chemical plants is all about being prepared to react quickly to unplanned requirements. Since the scope of such jobs is often not known beforehand, plant owners need their contractors to respond and fix or replace parts safely and quickly. Due to the nature of a refinery or chemical plant’s live environment, many safety rules and regulations apply to maintenance work. A basic amount of personnel with lifting and transport equipment is required on site daily, dependent on the site’s regular maintenance needs. Additional backup must also be available if maintenance activities are scaled up, with a team capable of handling all eventualities. Mammoet’s fleet and workforce offer the resources and flexibility to provide this regular cover with the option of additional support. Our extensive fleet and vastly experienced teams enable a flexible approach to providing cranes and other lifting and transport equipment when needed. In many cases, we are able to provide equipment on the same day that a request comes in. Mammoet’s long-standing maintenance expertise brings with it access to a pool of skilled people, all trained to Mammoet’s high operational and safety standards. We ensure our operators are fully trained on at least two pieces of equipment for greater flexibility in dealing with contingencies fast and efficiently. Because they have all the required safety training and certificates, they can go on site at very short notice. Mammoet’s maintenance personnel gain a lot of knowledge out in the field about the sites they work on. Plant familiarity is important to optimize the response to contingencies as they occur. Mammoet’s global fleet and workforce brings added value to maintenance projects and turnaround or shutdown operations. Instead of spending time training operators for new or different processes, we can simply scale up our operations. The professionals know the best way to work in tight spaces across the site. Sharing their knowledge with project planners and with other contractors on site adds to efficient utilization of equipment, assists with risk assessment, and helps identify issues that might require different solutions and equipment. All of these factors mean plant operators can keep downtime to a minimum when working with Mammoet. Charles Tshuma joined Mammoet Canada West in 2013 as a Site Manager looking after long-term maintenance agreements for refineries and chemical plants. Here he explains the importance of having a professional and dedicated team to support maintenance and shutdowns. Mammoet’s heavy lifting and transport expertise is pivotal during refinery and chemical plant turnarounds. We’ll safeguard your timeline, your budget and your reputation. Keeping turnarounds on schedule in the petrochemical industry can only be achieved through meticulous planning and close collaboration between all the parties involved. Mammoet plays a key role in realizing the projected schedule safely and efficiently because so many of the interdependent processes along the critical path rely on engineered heavy lifting expertise. During the working life of a refinery or chemical plant, planned shutdowns are inevitable. Carried out in order to facilitate necessary maintenance, inspection, replacement and expansion work, turnarounds and shutdowns take years of planning. The objective is to ensure that the period spent offline is as short as possible, while at the same time executing the work safely and on schedule. A turnaround can occur in a matter of weeks with the right planning. By involving Mammoet early in the planning process, we can help you identify all the interdependencies on the project that rely on heavy lifting and transport expertise, and thoroughly plan a chain of activities resulting in an optimized schedule to keep plant downtime to a minimum. By taking this integrated approach, all required tasks and activities can be tailored into an interlocking sequence. Overruns that extend the critical path will lead to time lost, additional costs and potentially damaged reputations. The timely execution of the tasks by various contractors is often dependent on the removal of decommissioned components, and the transport, lifting and installation of their replacements. That puts engineered heavy lifting and transport specialists like Mammoet directly on the critical path of the turnaround operation. The highest level of integration of all tasks and activities can only be reached by involving our engineered heavy lifting and transport professionals early in the planning process. A detailed plan for all engineered heavy lifting and transport activities across an entire turnaround operation identifies opportunities to shorten the critical path – reducing the period of scheduled downtime as well as optimizing equipment utilization. We will carry out a thorough survey of the site’s accessibility for lifting and transport equipment and loads, and analyze the entire chain of related tasks and activities. Good access is not guaranteed. Over time refineries and chemical plants tend to become more complex and congested through expansions, alterations and additions to the processing equipment. In many cases, Mammoet can find creative engineering solutions that overcome these obstacles and challenges using our extensive variety of lifting and transport equipment and the expertise of our operators. During execution, our team of skilled and well-trained people will work continuously in shifts to realize the projected schedule. Detailed coordination and communication between all parties, sharing information and strict compliance with all safety standards are essential to avoid delays. This requires an integrated shutdown team, including experienced key contractors, working towards a common goal: safely maintaining the schedule. Working with engineered heavy lifting and transport specialists that have longstanding experience on different refinery sites and chemical plants leads to the smooth and timely execution of a turnaround. Mammoet’s expertise brings the flexibility to respond effectively to contingencies that could potentially disrupt the critical path, making sure the refinery or chemical plant will go back into production on time. Experience is such an important factor in the safe and efficient execution of a turnaround project. A successful turnaround always starts with thorough preparation, requiring a detailed and comprehensive overview of the work that needs to be done. Mammoet has extensive experience of turnarounds and a comprehensive knowledge of different refineries and types of chemical plants around the world. Through early involvement in the planning process, Mammoet can help realize efficient and cost-effective solutions – all with the aims of minimum plant downtime and maximum safety standards. Executing a turnaround operation is like achievement at the highest level of sports – a team of professionals focused on accomplishing a lot of work in a congested location over a short period of time. It requires technical expertise and experience. Within a matter of days you have to scale operations from practically zero to a fully geared-up turnaround team including hundreds of professionals with dozens of cranes working in shifts around the clock. Mammoet has the resources and capability to assemble a turnaround team of skilled and well-trained people fully aware of all site safety regulations. Our teams are united in one common goal: to keep the schedule while maintaining the highest safety standards. During a turnaround, all other contractors and subcontractors are dependent on the replacement of many large and heavy components. That puts our engineered heavy lifting and transport services directly on the critical path. To keep all elements of the project on track and synchronized in the most efficient way, it is vital to maintain short lines of communication between all parties during execution of the work. As part of the turnaround team, Mammoet can plan for different scenarios to make sure the team will face as few surprises as possible once the operation starts. An experienced turnaround team of skilled and well-trained people with creative problem-solving skills and reliable equipment is essential to deal with unforeseen circumstances as they arise. By finding smart solutions Mammoet will minimize the risk of lost time, damage and incidents – while always making safety a top priority. Wouter van Noort is Managing Director at Mammoet Europe. He started working for Mammoet in 1995, first as SPMT operator and crane planner, then specializing in maintenance and turnaround operations for refineries and chemical plants. With Mammoet as your partner you can coordinate all heavy lifting and transport activities site-wide to minimize shutdowns and ensure safety and efficiency during a refinery expansion. Expanding an operating refinery or chemical plant brings many challenges not faced during greenfield construction. The live environment is subject to strict operational procedures and stringent safety regulations. The area will be populated with equipment and storage facilities, and it is crucial that disruption of day-to-day activities and scheduled downtime are minimized. You can achieve this by working with Mammoet, an engineered heavy lifting and transport specialist with vast experience in planning, streamlining logistics and executing petrochemical expansion projects. The objective of most expansion projects is to increase the capacity of a refinery or chemical plant. During this process, it is essential that all transport and heavy lifting of components is planned appropriately to shorten the critical path, increase the overall efficiency of the project, minimize disruption and limit loss of productivity due to shutdowns. Mammoet will carry out route studies that help identify the best access routes for getting oversized and heavy components to the site, while minimizing disruption of refinery or chemical plant operations. During execution, our engineered heavy lifting and transport equipment and expertise provide safe and flawless on-site transportation and installation. In addition, we have the flexibility to respond quickly to unforeseen changes that could potentially disrupt the critical path or impact the live environment. Disruptions are further reduced and overall project efficiency increased thanks to our development of an integrated approach to heavy lifting and transport across the site. With Mammoet as your one point of contact and coordination, managing a single pool of equipment and operators, lifting activities can be aligned and optimized during the expansion work. This keeps schedules efficient, maximizing effective utilization of equipment and labor. It will also reduce the amount of equipment needed on-site, limiting disruption and lowering costs. Having one dedicated team of professionals closely coordinating all heavy lifting and transport activities ensures the highest standards of safety in the live plant environment. This minimizes the risk of incidents and the downtime that can result, and means the expanded refinery or chemical plant can be brought back online as quickly and cost-effectively as possible. After safety, time is the most important factor for any plant turnaround. The longer a plant is down, the more it will cost in lost revenue. During refinery and chemical plant expansion projects, our clients aim to keep the entire plant, or large parts of it, in operation as long as possible. Mammoet has a long track record in carrying out refinery and chemical plant construction and expansion projects. Safety is always of the utmost importance to us. Our people work on refineries and chemical plants all the time and it is second nature for them to implement the highest safety standards. It is essential to keep interruptions to ongoing production work to an absolute minimum, to prevent breaking the schedule and additional costs. We can help minimize potential disruption upfront through careful planning and creative engineering. Through logistical streamlining, we are able to make the best use of people and equipment to increase efficiency and save costs. Teamwork based on trust is very important to achieve the best results while maintaining the highest safety standards. Anyone can mobilize equipment – it is the people that make the difference. In many cases, refinery and chemical plant expansions are carried out by different contractors and subcontractors. Each brings its own workforce and equipment to site. They tend to work on multiple construction projects in adjacent areas. This means identical lifting and transport equipment and people with the same skills are present in numerous places across the site at once. However, often they are not all in use at the same time. Mammoet can bring about the most efficient use of labor and equipment by integrating and coordinating heavy lifting and transport services site-wide, supporting all contractors and subcontractors. This not only ensures maximum utilization of these resources, but it also means that all engineered heavy lifting and transport activities are subject to the same quality and safety standards. This approach makes the most efficient use of equipment, keeping interruptions and downtime to a minimum, thus minimizing the overall cost of the expansion project. Anja den Braber, Project Manager Integrated Projects, joined Mammoet in 1998. Before becoming a project manager, she gained a broad working experience in different positions on refinery and chemical plant projects, including site expansions. Mammoet has the skills, experience and lifting equipment to facilitate the safe and efficient relocation or decommissioning of petrochemical plants. Often the relocation of a refinery or chemical plant offers a cost-effective alternative to building a new one. With Mammoet as your engineered heavy lifting and transport partner, you can dismantle an entire plant, lift the components onto the means of transport, move everything safely, and then reinstall the plant at its new location. Working with Mammoet guarantees you’ll have the skills, experience and equipment on hand to execute the move safely, on time and on budget. One of the main challenges is that neither refineries nor chemical plants are designed and built with relocation in mind. A detailed engineering study is required to determine how to break down and transport the plant in sections. Where modular construction techniques have been used, relocation is easier. A refinery or chemical plant can usually be dismantled into its original modules and components, such as reactors, distillation towers or coke drums. However, relocating a stick-built construction requires reverse modularization – designing the most efficient way to break down the processing equipment into reinforced modular sections. Mammoet can assist you from the very beginning of the refinery or chemical plant relocation process. Our experience is vital in determining the size and weight limits of each component to efficiently lift, transport and re-install them at the new location. Through close cooperation in the early planning and design stage, our engineered heavy lifting and transport specialists can define the engineering parameters and develop an optimal logistical process. Next, it will be up to us to meet that logistical challenge. All modules and components will need to be lifted and transported to the new location safely and undamaged. The locations of both the original and the new site will each present logistical limitations. Our engineered heavy lifting and transport experience is pivotal in realizing the most efficient logistical process. Route studies help identify logistical bottlenecks, enabling us to avert or mitigate risks and to find the safest and most efficient route. The logistical plan also needs to ensure all modules and components arrive in the right order and at the right time at the new location for efficient re-construction of the plant, while optimizing the use of shipping space. The logistical analysis needs to take into account on-site logistical possibilities and the capacity and reach of different lifting equipment for dismantling at the old location and reconstruction at the new site. When a refinery or chemical plant reaches the end of its economic or technical lifecycle, certain vessels and components may still be suitable for re-use. Or they may require dismantling under special conditions in a contained environment. In either case, before the plant is demolished, engineered heavy lifting and transport specialists can remove and transport these items to support the most cost-effective decommissioning within safety and environmental regulations. Case The fast track to productivity. Relocation of an existing petrochemical plant as opposed to investing in a completely new one is sometimes dismissed based on the misconception that it is impossible to do this cost effectively. However, with Mammoet’s assistance many refineries and chemical plants can be taken apart, transported and rebuilt in another location, either in the original modules, or reverse modularized in the case of stick-built facilities. Over the years, Mammoet has organized and executed the relocation of a number of plants for the petrochemical and other industries. That hands-on experience is invaluable. Mammoet’s deep expertise enables us to provide specialist insight in many crucial considerations for plant relocation projects. The key to achieving an efficient and cost-effective relocation process is early cooperation between Mammoet and the client. We need to make a careful step-by-step analysis of the constructional aspects of the refinery or chemical plant and its processing equipment followed by a logistical analysis of the relocation. By accurately determining the maximum allowable sizes and weights for the modular sections and components, we can ensure the required reinforcements are made for safe, damage-free transport. We have seen projects where the lack of good preparation has led to a lot of additional engineering and construction work, resulting in increased costs and delays. As your heavy lifting and transport partner, Mammoet can oversee the entire disassembly, logistical and re-assembly process. We will have our own people and equipment on-site, and will charter the shipping and arrange all the documentation for the move. The entire process is overseen by our own project manager who is the client’s single point of contact, ensuring on time and cost-effective delivery. We ensure the entire logistical process is handled well and fully integrated with the disassembly and re-assembly on both sites – and that quality assurance is reflected on-site. Instead of working with multiple subcontractors Mammoet will be your one point of contact, making sure the job gets done safely and on time. Robert Roest, Senior Account Manager for Mammoet USA, started working for Mammoet as a project engineer and site manager in 1995. He has worked on the logistics for components and modules in construction, turnaround and relocation projects around the world.